Also spending time at Fitzroy and Hawthorn, Scharp played 7 games and kicked a single goal for Carlton after debuting in Season 1930. He was born in Kew, and spent time at the following football clubs; Scotch College, University Blues and Kew, the latter being the club the Blues recruited him from. In 1933, Scharp bobbed at two rival VFL clubs Fitzroy (2 games) and Hawthorn (1 game). 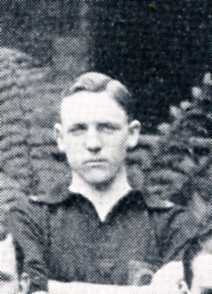 Scharp played rounds 8 and 9 for Fitzroy and round 10 for Hawthorn of the 1933 season. The irony was that in rounds 9 (Fitzroy) and 10 (Hawthorn) he played against his old club Carlton on both of these occassions. 1935, The Corowa Free Press May 10 (p6) reports that Scharp a former Carlton player is now coach of the Yarrawonga Football Club. Bruce Wotherspoon Scharp passed away in 1980 aged 75. Bruce Scharp aged 17 1922; Pic. Courtesy of Scotch College. Contributors to this page: blueycarlton , Bombasheldon , Jarusa , molsey , pblue , tmd1 , true_blue24 and admin . Page last modified on Thursday 22 of June, 2017 14:44:10 AEST by blueycarlton. 1973 - Adrian Gallagher Article (page 1 of 2) 05/05/73. 1980 Rd 22 - Match Reviews.